wherever you go, P2 slips easily into your bag or pocket. Shake or tap to access smart features via Beoplay App and enjoy up to 10 hours of Bang & Olufsen Signature Sound on one battery charge. Only premium materials make up the casing of P2 - pearl blasted, anodized aluminium grill over the speaker, polymer underneath. 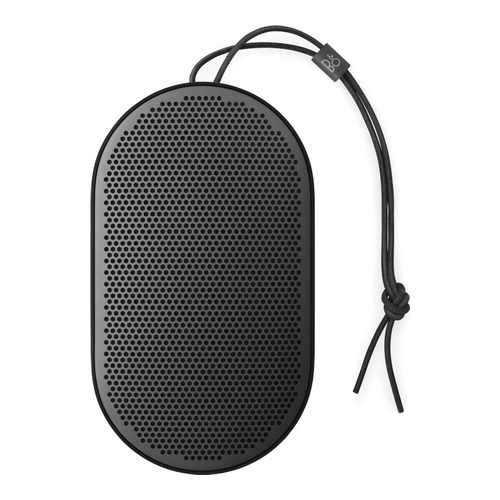 Beoplay P2 comes with a genuine leather strap that is dust and splash resistant. The drivers inside the speaker are dust and splash resistant - and the areas where the aluminium is attached to the polymer are sealed so dust and water can’t get in. Beoplay P2 is a truly personal and fully portable Bluetooth speaker with rich, full bodied sound. Designed so you can enhance your personal audio experience wherever you go, P2 slips easily into your bag or pocket. Shake or tap to access smart features via Beoplay App and enjoy up to 10 hours of Bang & Olufsen Signature Sound on one battery charge.